An excellent overview of SQL Server Reporting Services (SSRS). 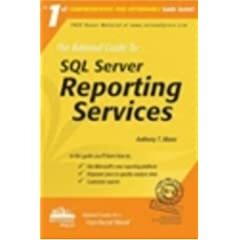 Pros: Excellent overview of SQL Server Reporting Services (SRS). The book is obviously entirely too small to cover any one aspect of SRS in depth, but it does a great job of quickly, and succinctly, providing a solid overview of the motivations behind the technology, as well as an introduction to how to deploy and leverage it. The flow is easy to follow, and the entire book is very approachable. The main benefit of this book is that you can easily read it in a few hours - providing a much better introduction to SRS than anything you could glean by reading various introductory articles on the web. Cons: Given the size, scope, and purpose of this book, there really are no negatives worth reporting. Some aspects of SRS are covered with a bit too much of a marketing bent, but if you're expecting an in-depth technical treatise on SRS instead of something analogous to a hybrid between a white paper and a brochure, then there's something wrong with you, not the book. Summary: After a brief overview of the needs for SQL Server Reporting Services (i.e. what niche it fills), the book quickly moves on to provide an overview of the reporting lifecycle, as well as key benefits of the platform such as programmability/extensibility, integration, security, and report delivery. A solid overview of SRS architecture then follows, upon which subsequent chapters provide additional details about Data Sources and Data Sets, report designers and functionality, customizing reports, providing interactivity, report processing and management, security, and server admin. The book then closes with three chapters dedicated to covering delivery options and strategies through various subscription and presentation formats.